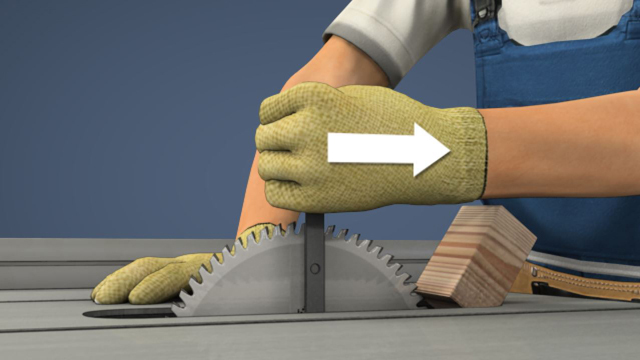 While removing a blade from a table saw, make sure to wear cut-resistant gloves. 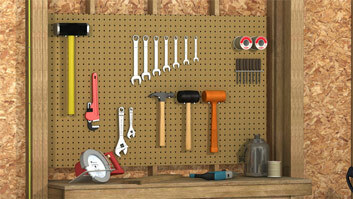 To remove a blade from a table saw, you will need to remove a few screws to be able to remove the throat plate. After tilting a blade, always make sure to return it to the vertical position, by placing a square on the table, and turn the hand wheel until it is parallel to the square. A mechanical saw used to cut wood in an accurate manner by pushing wood across a table and against a circular saw blade. 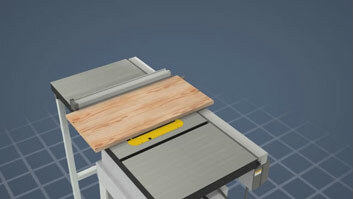 What are the components of a table saw? A power switch, the saw blade, the blade guard, the blade-height hand-wheel, the rip fence, the splitter, the throat plate, and the miter gauge. 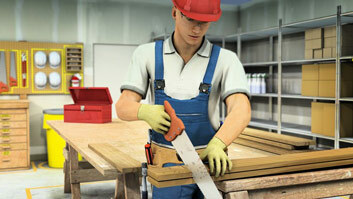 What are some safety guidelines for using a table saw? 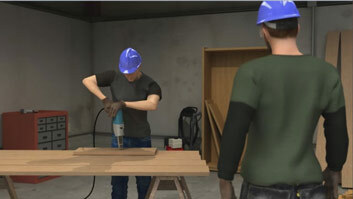 Use appropriate PPE, such as safety glasses and ear protection; properly adjust blade guard and splitter; unplug the saw before maintaining the blade; avoid distractions while operating; plan before you cut; don't wear loose clothes or gloves; don't cut used lumber; don't use a dull blade. What's the most important thing to do before inspecting, removing, or installing a blade? What does the splitter do? It is a wedge-like device that keeps the already-cut portion of the board separate. This prevents kickbacks, which can harm the operator. How does one set the width of a rip cut? By moving the rip fence so that the distance between the side of the blade nearest the rip fence and the side of the rip fence nearest the blade is the desired cut length. 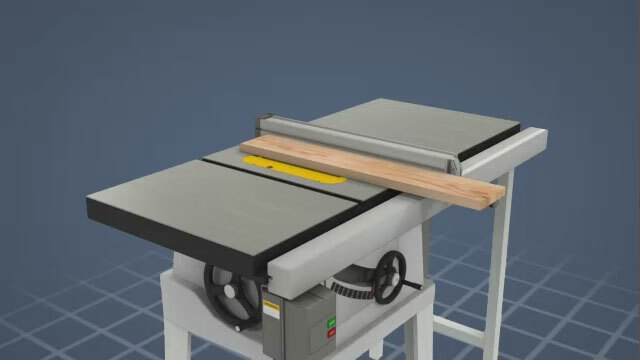 The main components of a table saw are: a power switch, which is used to turn the saw on and off, circular saw blade, which cuts through boards, blade guard, which covers the part of the blade above the table. This usually transparent plastic cover is hinged to ride up and over the piece being cut and is intended to prevent incidental contact with the blade. Blade-height hand-wheel, which adjusts the blade height. It is secured with a lock knob. Blade-tilt hand-wheel, which controls the angle of the blade and is measured by the tilt scale. This hand-wheel is also secured with a lock knob. Rip fence, which is used by the operator to stabilize and guide material as it is pushed through the saw during a cut. The distance between the rip fence and the blade determines the width of the cut. The desired width is set by moving the rip fence and securing it with the lock handle. Splitter, which is a wedge-like device after the blade that prevents the board from pinching the blade and causing a kickback. 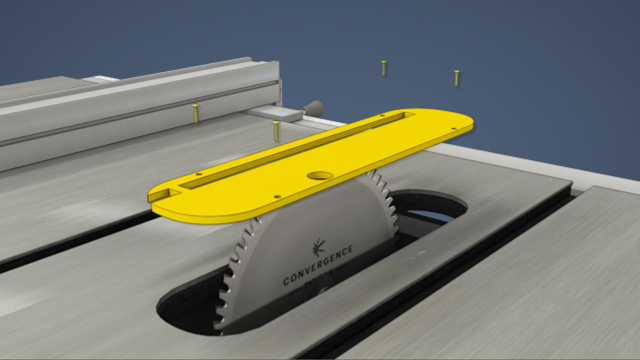 Throat plate, which is a removable surface in the table that allows access to the blade. And a miter gauge, which is used for guiding material through the saw when crosscutting narrow material. It slides in either miter slot in the table. 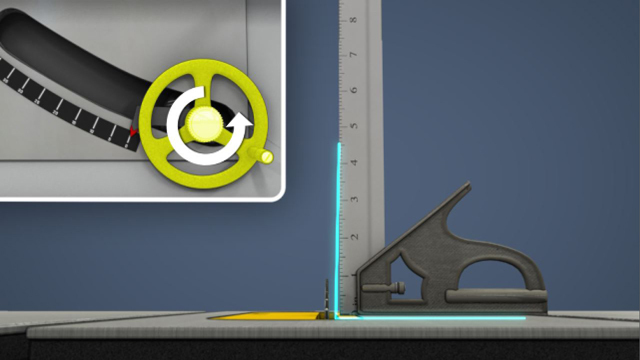 An angle scale allows material to be cut at precise angles. A lock knob secures the angle setting.